Truly effective commercial-boiler installations — Gavin Watson. ­ In the complex and multi-disciplinary environment of building services, keeping up with the latest boiler technology can be a challenge. Gavin Watson of Elco Heating Solutions explains what is required from a modern commercial boiler and the key performance parameters. Over the last few decades, our EU neighbours have introduced a raft of regulations and directives that have helped shape the commercial-heating industry. These have been particularly prominent in the gas condensing-boiler market, where minimum efficiency levels have affected the way in which a unit is designed. Subsequently, many established manufacturers, such as Elco Heating Solutions, continue to push the boundaries of boiler technology — ensuring they can offer the highest levels of performance and provide units that can be adapted for the extensive demands of commercial building-services. So, what aspects of wall-mounted boiler performance need to be considered? Well, there are many in-depth variables, depending on the type of building the boiler will be operating in — but also some more practical areas of a design that can easily be overlooked. Starting with the one of the simplest, it’s important to examine outputs – or more specifically how to achieve the necessary output as efficiently as possible. Delivering heating and hot-water services to any size of building is not a problem, but it’s the choice of boiler configuration that can have a discernible effect on a system’s efficiency. 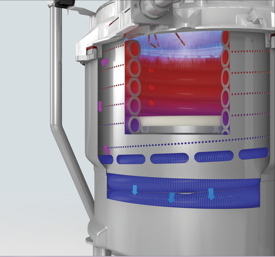 A component of a boiler that can have a spectacular effect on its performance is the heat exchanger’s material and internal design. For the wall-mounted market, the operating range is always going to be capped, as reaching the higher loads of certain applications is only suitable for floor-standing units. However, wall-mounted cascade systems have huge potential across the commercial environment, and that potential is growing thanks to flexible cascade arrangements. Many light-commercial installations today utilise a cascade setup of two or three boilers, while many larger projects will increase the wall-mounted rigs up to seven or eight. 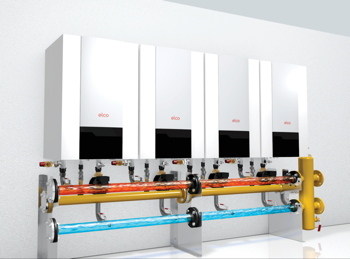 So, with a boiler such as the new Thision L EVO from Elco, which is available in six models between 60 and 140 kW, there is scope for outputs up to 1.1 MW, depending on the building’s load. Such cascade systems also offer incredible turndown ratios for improved seasonal efficiencies. This is important considering boilers are sized to meet the design conditions — even though these are rarely encountered as they are set to meet a worst-case scenario for the middle of winter. Consequently, in the spring or autumn, when there is a reduced demand for heating, the system needs to be turned down. With one or two larger boilers, the kind of turndown required can be trickier to attain compared to a more flexible cascade system comprising several boilers. Typically, one boiler might give a 6:1 turndown rate, whereas an installation of five units in cascade would deliver a 30:1 turndown rate. The closer the heat generation can be matched to the load, the more seasonally efficient the system becomes — saving fuel and reducing emissions. A more complex and increasingly important aspect of boiler system design is the difference between flow and return temperature. For gas boilers to condense properly and extract the maximum waste heat from flue gases, the return temperature has to be below 54°C. This has become more prominent in the commercial boiler market, with designers looking to optimise total ownership costs by increasing the temperature differential, as well as reducing flow rates and lowering pump operating costs. Consequently, it is important to consider the flow and return temperature differential of a wall-hung boiler, with a ΔT of 30 K representing impressive capabilities. Cascade systems offer incredible turndown ratios for improved seasonal efficiencies. Another component of a boiler that can have a spectacular effect on its performance is the heat exchanger’s material and internal design. Stainless steel is commonly regarded as offering the highest levels of efficiencies for the lifetime of the heat exchanger, due to the metal’s ability to withstand the extreme internal environment. However, the design of the heat exchanger is equally important to ensure a commercial boiler performs to its full potential, and Elco has identified key variables that optimise that performance. The geometry of the heat exchanger is particularly crucial, as it can have a direct effect on energy consumption and heat transfer. The Thision L EVO, for example, has a double-wall geometry that provides optimum heat transfer at both full and partial load, while also achieving a flue gas temperature of 2 K above the return temperature at full load. On paper, specifying a commercial boiler can appear a simple task. However, there are a raft of considerations that are not always apparent on the surface, but which can combine to make a vast difference to total running costs. Identifying these early on and appreciating their impact at a deeper level will ensure a successful specification and a truly effective installation. Gavin Watson is sales director at Elco Heating Solutions.